The purpose of this newsletter is to keep our residents informed on the happenings in the Town of Wrightstown. Included is the 2018 financial summary for the Town of Wrightstown as well as the 2018 financial summary for Sanitary District #1. You will also find the garbage/recycle schedule and featured articles from town administrators. Please forward suggestions for future newsletters to treasurer@townofwrightstown.org. Please, place your green recycling cart to the curb by 5:00am. Holiday Service: If your scheduled pickup day should land on a Holiday, you will receive next day service. Single Stream Recycling: Carts should be placed at least 4’ apart or on separate sides of your driveway. The following are items acceptable for single stream recycling and should be put in your green recycle cart. Glass: Rinsed bottles and jars of any color. Steel/Aluminum: Rinsed aluminum, steel, bi-metal cans, and non-pesticide aerosol cans. Plastic: Rinsed containers where the neck of the bottle is smaller than the base or widest part of the container such as soda bottles, milk jugs, laundry bottles, vinegar containers, shampoo, conditioner,yogurt, cottage cheese type plastic containers, and plastic containers that held solvents and pesticides. Paper/Cardboard: Clean cardboard and paper such as magazines, books, junk mail, envelopes, phone books, catalogues, writing paper, newspaper, and shredded paper placed in a grocery bag in your recycle cart. All cardboard must be cut to fit into your recycle cart. 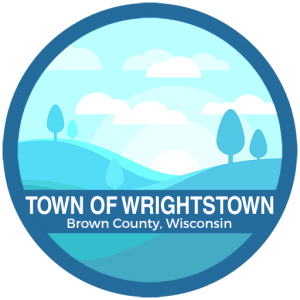 GARBAGE PICK-UP for the Town of Wrightstown is every Wednesday. Dumpster must be out on the curb by 5:00 a.m.
Real estate tax bills are sent out from the Brown County Treasurer’s office usually the second to third week in December. Please see the change in payment procedure on the link from our home page. Any questions can be directed to Jeanette Roskom, Town Treasurer at 664-3119. Note: any dog over 5 months of age must be licensed. You will also be required to present RABIES VACCINATION CERTIFICATE issued by a veterinarian. Applications for liquor, cigarette and operator’s licenses may be obtained by contacting Donna Martzahl. Greenleaf Volunteer Fire Department annual picnic – third Sunday in July at the Fireman’s Park, corner of State Highways 57 & 32 and Fair Road. The community of Greenleaf is served by a sanitary district with both water and sewer service. Meter reading dates are approximately the 15th of March, June, September and December. Sanitary District No. 1 utility payment questions should be addressed to Stephanie Owen at (920) 309-1483 or sowentwsd@hotmail.com. Questions regarding early readings or meter problems may be addressed to Bob Brick at (920) 360-7560 . Before watering a new lawn or filling a swimming pool, contact Bob Brick for metering. Adjustments cannot be made after you’ve used the water. Requests for special assessments letters are made to Jeanette Roskom, Town Treasurer. The fee is $25.00 per parcel per request. These requests may be e-mailed to jeanetteroskom@gmail.com or call to (920) 664-3119. If the property location is within the Sanitary District No. 1 information regarding final water and sewer billing may be requested at the same time.